Quebec’s Tantalizing Eastern Townships: A new delicacy at every turn. part 2. Domaine Pinnacle is a family owned orchard and cider house, where you can learn, tour, and taste, as well as stock up on their smooth, sweet, lush estate-bottled Ice Wine. This award-winning golden nectar is created from a blend of six different apples and can be drunk as an aperitif, dessert wine, or just about anytime. Cause for a celebration? Try Domain Pinnacle’s new Sparkling Ice Cider-first in the world! 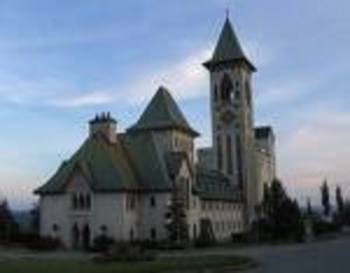 The Saint-BenoÃ®t-du-Lac Abbey was founded in 1912 and offers a haven of peace and serenity and some damn fine cheese. This Benedictine monastery is situated on a hill by Lake Memphremagog and is very medieval looking with its majestic gray-brick towers and spires and stunning brick interior arches of yellow, red and gold. 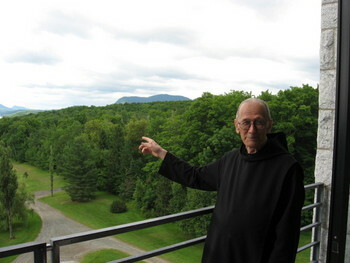 He explained that the 50 monks spend their days praying and working in their orchard, cheese factory, farm or boutique. The gift-store is stocked with a variety of monk-made products, although they are most famous for their cheeses, which include a rich blue Ermite, a nutty-Swiss St.-Augustin, and their firm L’Archange made from goats milk. Just as I was gathering up my selections, which included some delish dolce-de-leche ice cream that Pere Boldoc turned me onto, a bell chimed, which meant that there was only 5 minutes until prayer time so I had to quickly slurp down my ice cream as I scampered up the stairs just in time for their service, which is still held in a hauntingly beautiful Gregorian chant. After cleansing your soul at the Abbey, stop in at the nearby Savon des Cantons to learn the benefits of using their all —natural soaps for cleansing your body. Savon des Cantons is the first interpretation center about soap in the province of Quebec. Attend a demonstration and you’ll be amazed at all the research that went on to develop their products. Before you leave, stop by the boutique, where the staff will happily help you choose a soap that is just right for your particular skin. (Their “Precious” soap made my skin so soft that I have learned enough French to order more off their website!) Or if you are a DIY, make your own soap at the fun en Bulles soap bar where you can select your trademark fragrance, color and herbs.